It’s funny, isn’t it? When you proclaim that something isn’t going to happen, the chances of it happening increase tenfold. I once said that I was never going to the United States, and if I were, at least I would never go to Los Angeles. I’ve been to the US, twice. Both times in Los Angeles. Funny how that works. I also said that even though I had bought Market Street, Green Grocer, Fire Brigade, Pet Shop, Grand Emporium and Parisian Restaurant, I wouldn’t get Café Corner. The first of Lego’s incredible line of modular houses was simply too expensive, and besides, it was too tall to fit in my shelves. And now it sits here at my desk, waiting for a slight modification to trim it down a little. Café Corner, like Market Street and Green Grocer, has appreciated in value a lot since its release in 2007. You need to be prepared to pay at least three or four times the original cost for a chance to own the original set. Obviously, I wasn’t going to do that. There are limits. 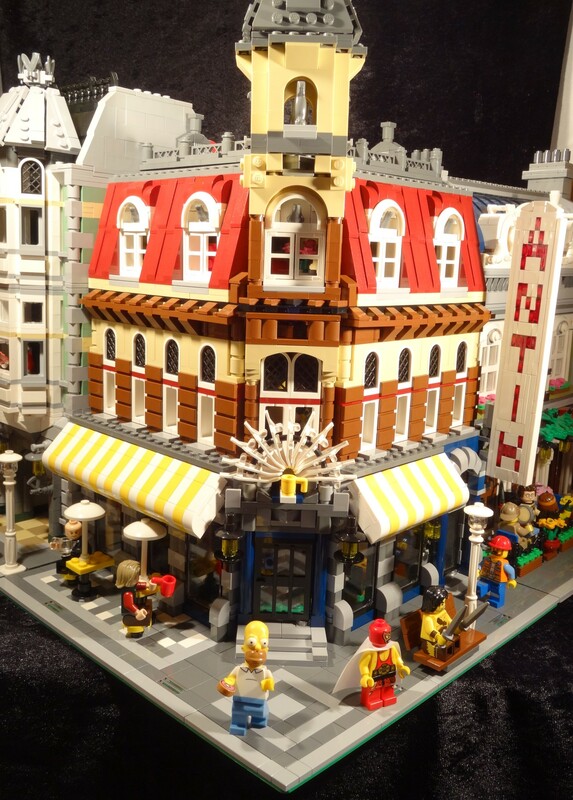 But just like the other two, Café Corner can be built out of any suitable Lego pieces, there are no unique parts. So once again I took a good look at my Lego assortment and started figuring out what I needed. I’ve talked about the process of piecing together a set before and I’m writing a specific guide on how to do it, so I won’t get into that here. What might be useful is discussing what parts require some extra expenses. * The dark blue archway was once rare. Not so much anymore and you only need one. In a bit of foreshadowing, I had ordered an extra when I got Market Street. * The dark blue half arches can be hard to find and are completely disposable, since they are covered up by the stairs and not even visible in the standard model. I bought them, but there’s a bit of money to be saved going with grey ones instead. * The dark blue pillars can be a little hard to find. * The 11 skis that make up the front sign can be tricky to track down, since there is a newer model of skis now. * The front door (black with three sections) and side door (light bluish grey) are expensive, especially the latter. With some of the ridiculous prices, it’s better to track down the set Krusty Krab instead for just a little more. However, I chose a black one instead for a fraction of the cost. All the front doors and windows are black anyway, so it looks more consistent this way. I bought the correct front door since it’s so prominent. * I didn’t get the minifigures, the bike or the cherries, since those are just loose items that I won’t be posing in this display. I got a darker trash can which is still in production rather than the light one. * There are 20 white panels that come together to form the second floor windows. Originally those didn’t have supports along the side. These older versions are incredibly expensive while the new ones are everywhere. This gave me slightly narrower windows at a much lower price. * The top floor windows are a very old mold (I remember having some in my first Lego from 1984) with a single, four pane inset. These are extremely hard to find and you need five. However, there is a newer version which accepts modern standard two pane parts, which looks better to me anyway. With these, the cost was much more reasonable. * Along the wall of the second floor are two 2×10 reddish brown bricks. These look perfectly ordinary, but because they haven’t been made for years they go for crazy prices. Functionally, you can use a combination of 2×2′s, 2×4′s or 2×6′s to fill that space. * The dark red slopes that make up the front roof are pretty and very important for the look of the building. Luckily, they’re not too expensive but it can be tricky to find enough of them with one seller. * The grey parrots in the tower section are a bit expensive, but since we got new ones with Metalbeard it shouldn’t be too hard to find them right now. If you’re going to shorten the tower to save space, you won’t need these at all. * There are four light bluish grey turntables that hold the angled front in place, along with a few common black ones. The grey turntables are extremely expensive. They are indeed visible from the front, so you don’t want too outlandish colours. Black ones could work, but I tracked down some old grey ones which were much cheaper. * A bunch of dark red and dark blue pieces are used, but most of these can be found at Lego S@H Pick-A-Brick for good prices. The build itself was quite enjoyable, except for the plain back walls and the endless tiling of the baseplate. Despite its age, there are a number of impressive techniques used. 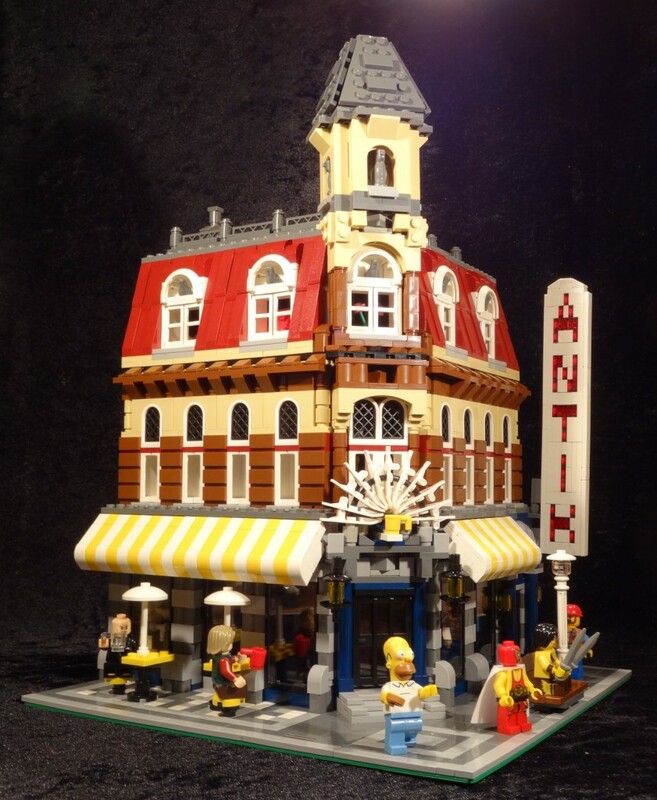 The HOTEL sign (which I built and then modified for my purposes) has a clever sideways part for the E. The side entrance has a fancy top part, which is not entirely legal by Lego’s current rules, but very cool. It seems flimsy until you realize that the bent tube actually holds the grey parts in place along the arch. And of course, the sign made out of skis is a crazy idea of its own. However, the most brilliant part is not readily visible. When you take a closer look at the front section (which is 6 studs wide) you see that it doesn’t quite fit diagonally between the sides. 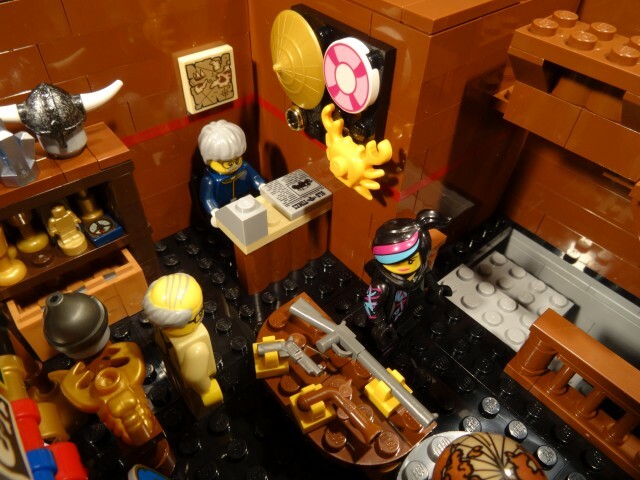 Instead, all along the front part either the sides or the front itself has rounded bricks or those palisade bricks. This provides JUST enough space for the last millimeter of the corners, and even helps to secure the entire thing completely. I can’t even imagine how you would come up with such an idea. 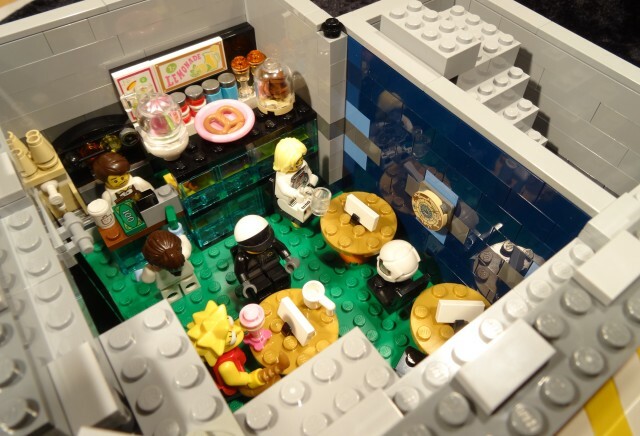 Unlike the newer modulars, Café Corner doesn’t have an interior. This would have been annoying a year ago when I didn’t have as many spare parts, but now I enjoyed the challenge of designing them myself. I showed the new interiors in this previous article. However, I made a few more changes. Above all, I wanted to do something with the wasted space beneath the stairs. You could make a nice little bathroom for the café but I didn’t want to destroy that fancy mural, so I just put a backdoor in there. This is also the only way to admire those expensive, useless arches. I also changed the huge sign outside to ANTIK, for the antiques shop upstairs. The end result is simply stunning. It’s not as intricate as the Parisian Restaurant but it looks very realistic and dignified. The colour choices are great, with a good combination of dark red and blue with earthy tones. This is definitely one of the best looking modular buildings. It also has plenty of room for minifigures, although I added some spacers to the sidewalk to attach them securely. I’m happy that I decided to get this after all. It’s not quite as awesome as Green Grocer, but quite awesome still. It’s also great to have caught up on all of Jamie Berard’s modulars – the ones I’m missing are both made by another designer and the one I’m thinking of selling eventually was made by a fan. While it again cost me more than I had planned (I had originally planned to get the Bike Shop & Café set instead), it’s great to see that you can make it look just as good as – indeed in many cases better than – the original for a much more reasonable price. And now, I will not state that I’ll never get Town Hall and Palace Cinema. Maybe that way I can actually avoid getting them. 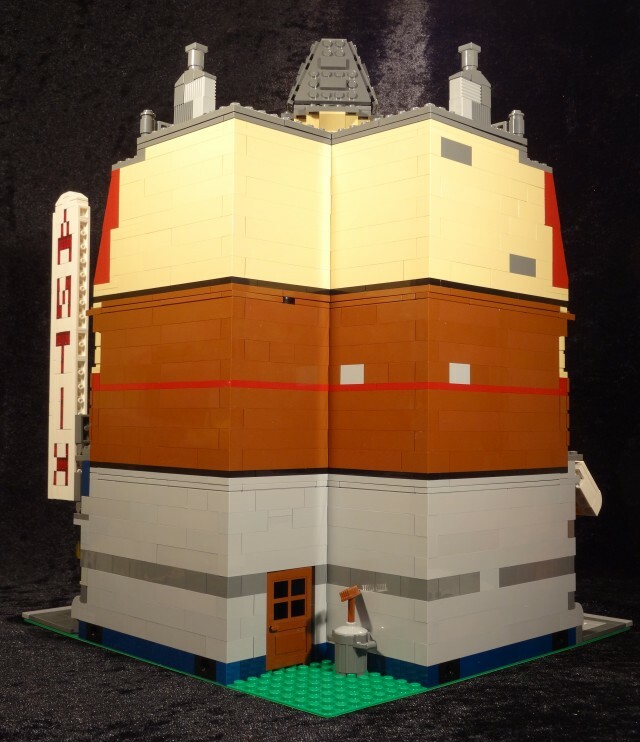 Det här inlägget postades i International, Prylar och har märkts med etiketterna Lego, Lego Modular Buildings, MOC. Bokmärk permalänken.